Things start well, though, as ‘…From Here’ is pretty epic. A six minute doom fest, the riffs are big, come loaded with a 70s deepness channelled by way of a nineties stoner edge, showcasing guitarist B.R.’s love of Sabbath throughout. A huge aid from the bass gives the riff plenty of weight – particularly during the slower chorus moments – chugging relentlessly almost from the get go. The riff itself wouldn’t be out of place on the Sab’s ‘Volume Four’, and indeed, A.th’s tenor crooning lends everything a very retro edge. He may be low in the mix, but he’s in fine voice, and by the time the band reach the funeral tinged instrumental break, complete with dark bluesy solo and twin leads this has been a track worthy of hearing – a fine, moody outing that could stand alongside the more accessible moments of that last album. Moving on, ‘A Funeral Alchemy’ at first seems as good as its title, comprising a doom riff, voices that sound like chants floating on the cold air inside an ancient European church. But that’s all it has – there are no other vocals to latch onto, no big hooks, no atmospheric solos – just a big riff. Once you’ve heard it a few times, the initial shine is very much tarnished and it takes place as something that sounds like b-side filler. Unless shortened and shoehorned into a concept album, it was always going to be a discarded oddment. ‘Reincarnation of the Highway Cavalier’, meanwhile, is very much more song oriented, but doesn’t always come across as typical Black Oath. There’s a good reason for that, of course: it’s a cover of sorts, a number constructed from elements of two tracks written and recorded by UK doomers Pagan’s Altar and reworked as a medley. It’s recorded with all the right reasons, being a tribute to the passing of PA’s vocalist Terry Jones…but the first half of the track, comprising folk metal elements and an odd vocal refrain about flowers and trees doesn’t sit so easily with Black Oath’s oft bleak viewpoint and the second part too often comes across like a lumpen Judas Priest cover, with only A.th’s voice remaining the clear link to Black Oath’s past and present. Given that this was meant very much as tribute, it would have been unfair of them to meddle too much, but the source material isn’t the best you’ve ever heard. 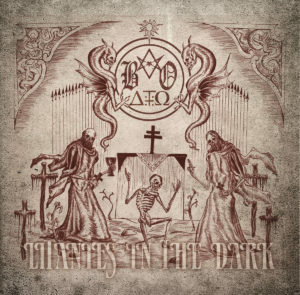 Still, that said, it’s very well played and shows Black Oath to be a band with a sense of scope not always present on their own stuff; there’s truckloads of metallic melody and a well crafted solo along the way. It might be a bit old-school metal by numbers, but it’s pleasant enough. Following three fully formed tracks (one of which is a genuine belter), the EP closes with ‘A Song To Die With’, a short and thoughtful instrumental, the kind of piece that feels very much like a link into something bigger. Thunder and lightning pave the way in traditional style, while a cleaner toned guitar lays down a mellow desert-oriented melody and sporadic percussion adds horror themed bell sounds. There’s a creeping darkness at play, although not any real heaviness and then at the mid point, a few crushing chords come forth with a classic riff, somewhere between Sabbath wannabes and a slow Slayer workout. Although a weak drum sound gives away somewhat demo origins, the stage is set for more enjoyable doom…and then with an audible wobble, the faders are slid downward and the music disappears into nothing. It sounds like a half formed idea bolted onto the end of the release…and, needless to say, it’s a definite anti-climax. In terms of leftovers, this is no more than burnt offerings. Taken at face value, this EP is okay for what it is, but there’s no escaping the fact that it is cobbled together rejects. If you have lots of other Black Oath material or are a Euro doom obsessive, you’ll probably want this, but it doesn’t always show the band at their finest. Compared with 2015’s finely crafted ‘To Below and Beyond’ LP it definitely comes up short – ‘…From Here’ aside – but then, that was always likely to be the case. This entry was posted in Album & EP Reviews and tagged doom, italy, metal, stream by Real Gone. Bookmark the permalink.